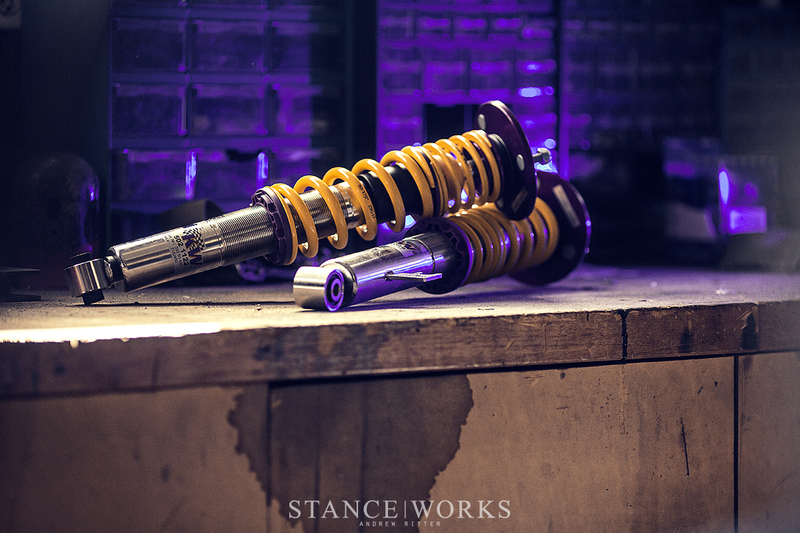 Coilovers are typically pretty familiar territory for the StanceWorks crowd. For folks like us, they’re often the first, second, or at worst, third modification we make to any car. From improved handling and ride quality, to absolute height control, they typically offer everything the layman asks for, and then some, and with most cars having an off-the-shelf application, installs are usually something any weekend warrior can accomplish in their driveway or garage. 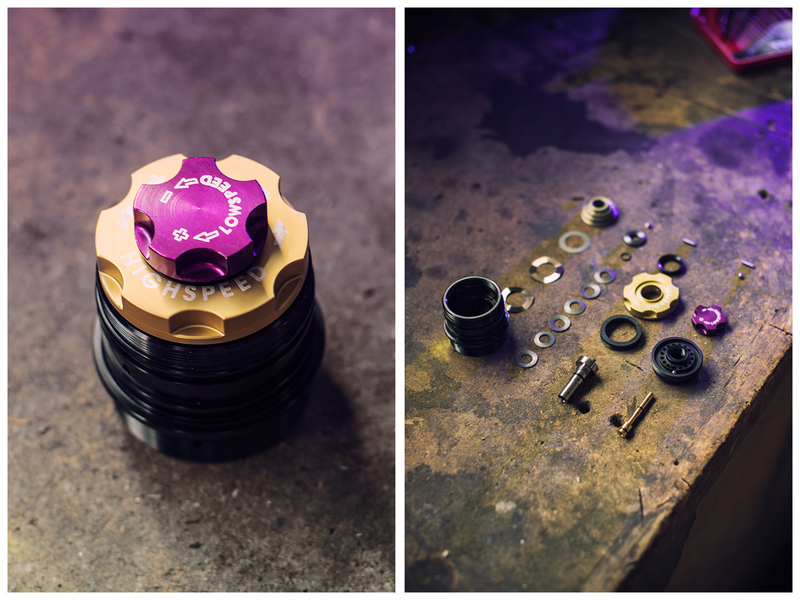 The areeauty and benefit of quality coilover systems is that it really is that simple. The behind-the-scenes engineering makes for a bolt-on product that simply works, and if that’s all you ask of it, you’re ready to hit the road. On the other hand though, that merely scratches the surface of coilover technology. 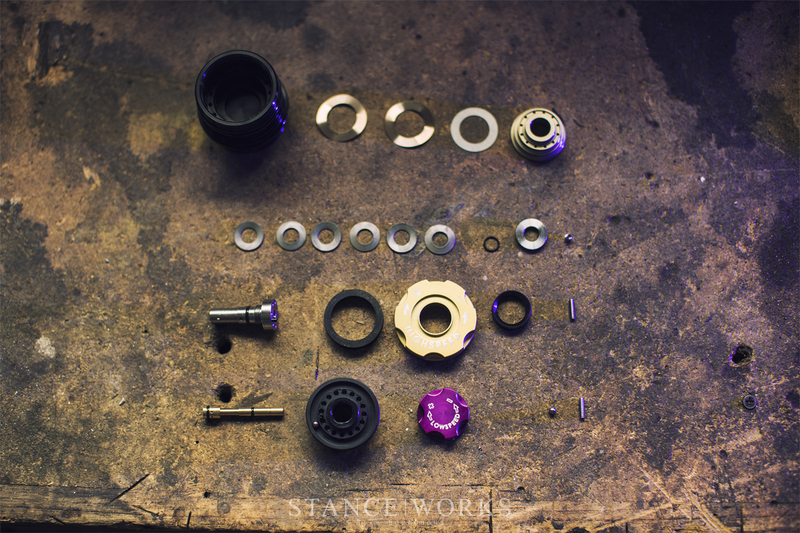 With familiar terms like mono-tube, twin-tube, rebound and compression, strut, damping, and more… well, things get overwhelming rather quickly. 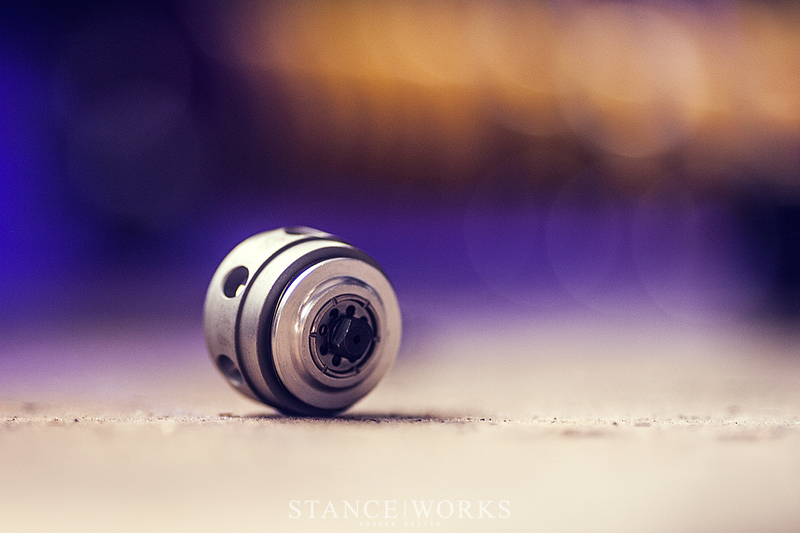 Luckily, KW has sent us some coilovers, components, and most importantly, permission to tear them apart, to see the inner workings for the ultimate coilover explanation. Let’s start with the basics. 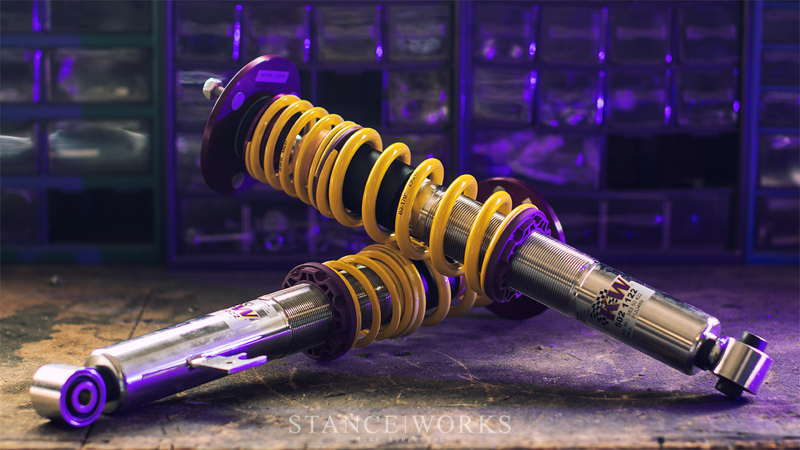 Struts, Springs, Shocks… What’s the Difference? In starting with the basics, it is important to make sure the base terms are ironed out. 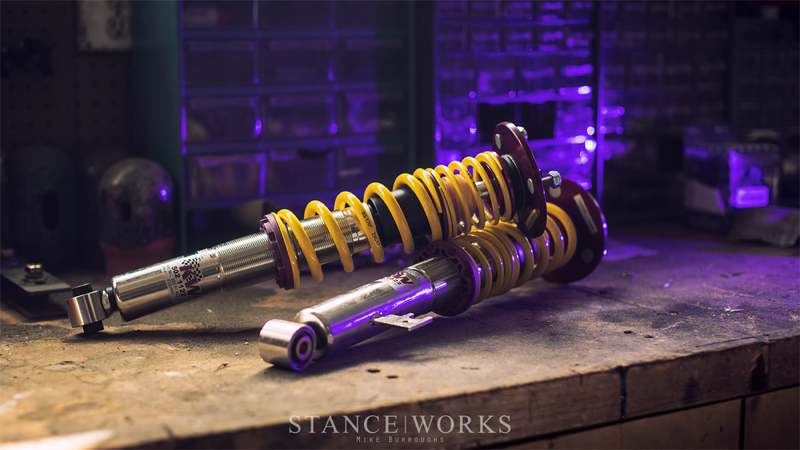 When it comes to suspension systems, the two most basic components are the springs and the shocks. While we could dive deep into the principles of each, we’ll aim to keep things short. 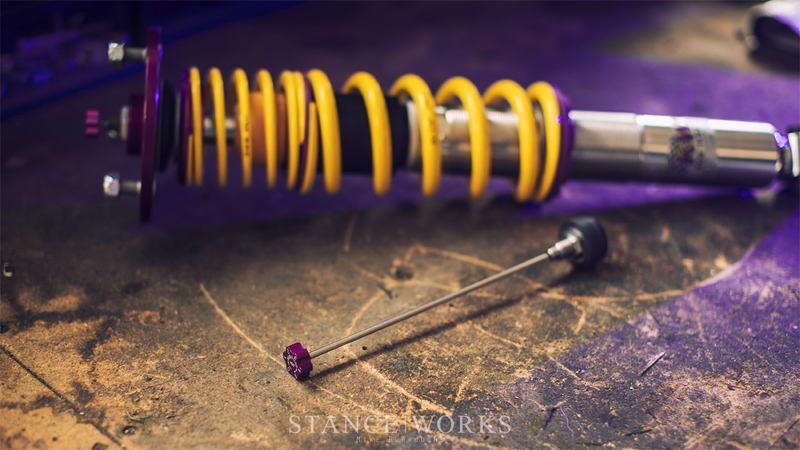 Springs allow your car to absorb the energy of bumps on the road, and shocks help dissipate that energy to smooth out the ride, instead of leaving your car to bounce up and down like a pogo stick on wheels. Together, they work in unison to define nearly every aspect of your car’s ride quality and handling characteristics. 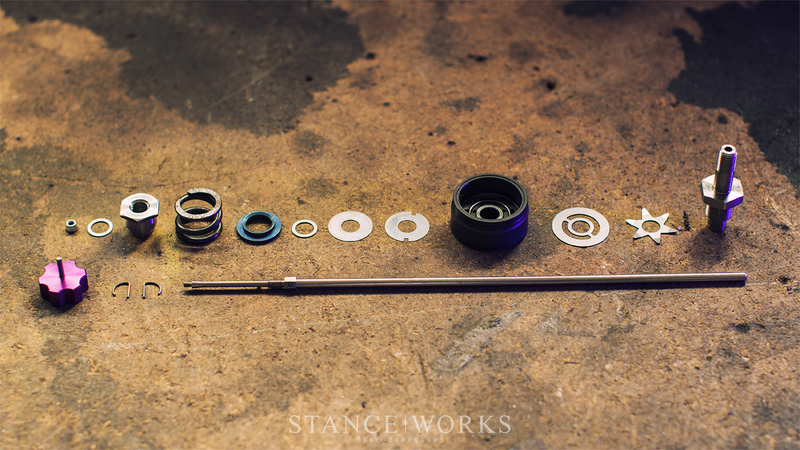 Without good shocks and springs, the rest of your suspension components will do you no good. When paired together as a single unit, springs and shocks form a strut, which can come in several layouts, such as MacPherson, Chapman, and others. For us though, those differences aren’t all too important. 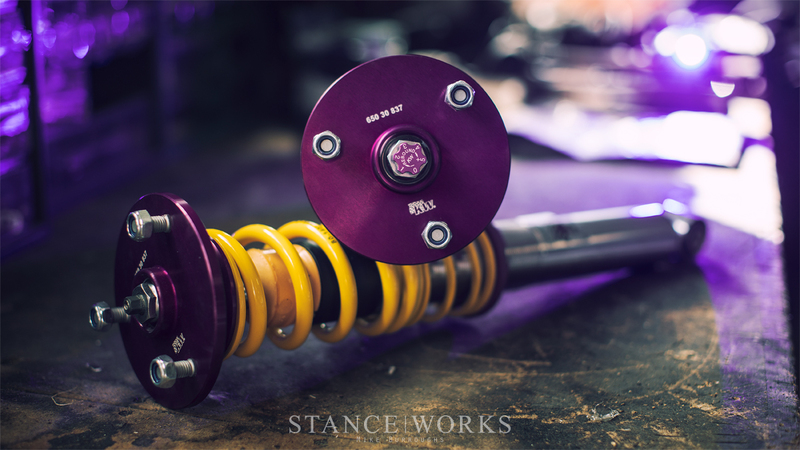 What’s important for now, though, is to note that all complete coilovers are, by their very nature, struts. Struts are a structural pairing of the two components, with the spring on the outside and the shock absorber on the inside. Damping, Rebound, Compression… What’s it all Mean? There’s a slew of vocabulary words when it comes to coilover systems, how they function, and how they can be adjusted and tuned for your application to maximize performance. We’ll keep the trend going and start with the basics: damping. Not to be confused with dampening - like when you run a towel under a faucet - damping, in physics, is any function or effect that reduces the amplitude of vibrations. 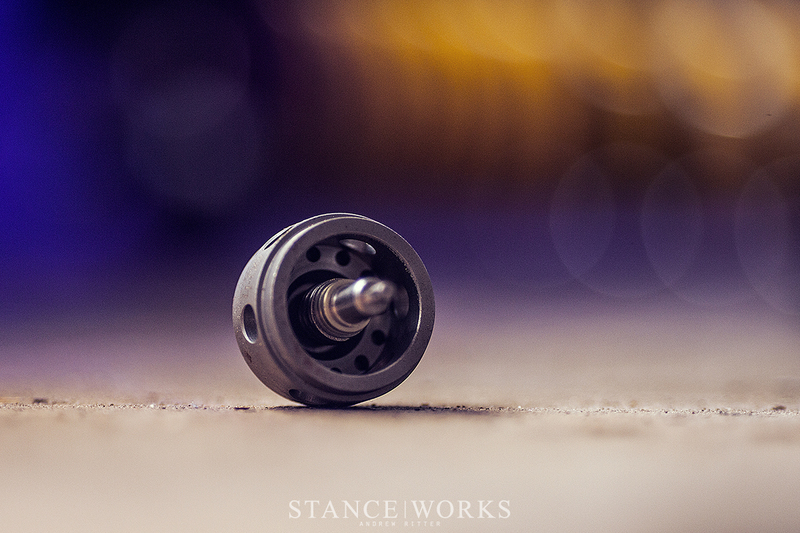 Shocks, and therefore struts, are dampers - damping is the base function of shocks. Rebound and Compression? They’re forms of damping, and are short for Rebound Damping and Compression Damping. Understanding what they mean is a pretty simple endeavor. Compression is what happens to the coilover over bumps - the forces applied to the spring compress it, and the shock works to damp the compression forces. After compression, the spring rebounds, attemping to return to its prior position, and once more, the shock works to damp the rebound forces of the spring. 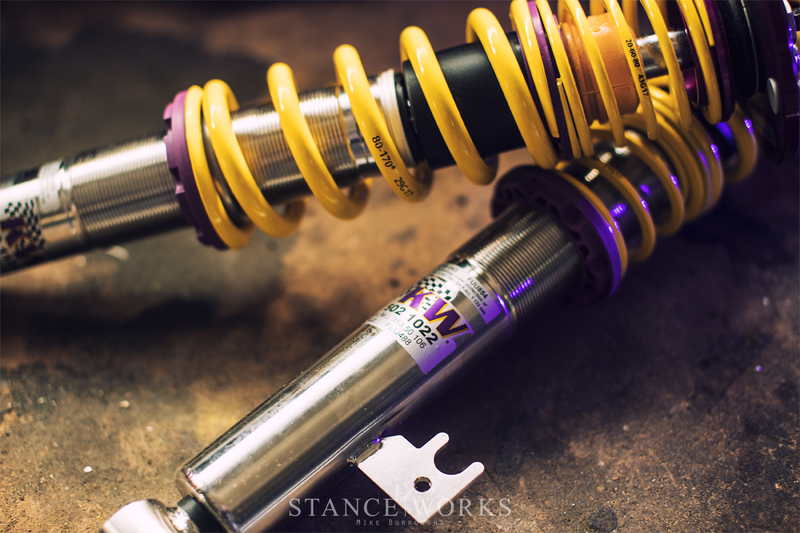 Compression and Rebound Damping adjustments help to fine-tune how the shock acts and reacts to these forces, controlling how quickly and how much the strut as a whole is allowed to move. It’s that easy. 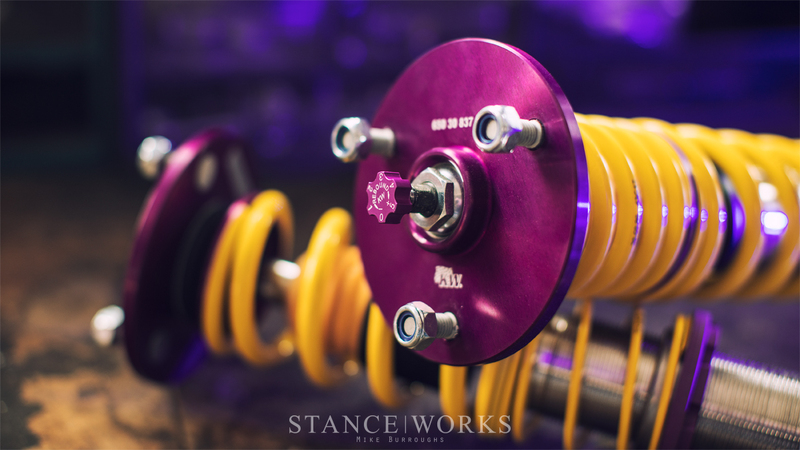 Dissecting it a bit further, some KW coilover variants and applications come pre-set from the factory, fine-tuned and dialed in specifically for your application. Other enthusiast-geared applications offer user-adjustment of these settings, and in varying levels. For starters is Rebound adjustment, which often comes with 16 clicks of adjustment for users to fine-tune how their coilovers react following compression. Some applications allow for tuning of low-speed compression: in other words, how the shock handles controlled movement. An example of this would be easing into corner load, or small changes in track surface conditions. Lastly, there's high and low-speed adjustment, which allows for tuning of compression for both changes in low-speed compression and high-speed compression, such as blasting over corner curbings, harsh track surface changes, and aggressive elevation changes. So, Uh, How Does That Even Work? There’s an immense amount of technology and engineering that goes into dampers. Even supplied with all of the technical info, I couldn’t begin to explain it here, but perhaps its worth a small thought experiment to understand the most basic aspects of shock adjustment. Dampers work by pushing a piston through a cylinder of oil. That’s over-simplifying it, but bear with me. Imagine swinging a ping-pong paddle under water. I’m not sure how you wound up in this situation, but it’s a helpful one given the topic at hand. Swinging the paddle would be rather difficult, in comparison to swinging it above water. Drill some sizable holes in the paddle, though, and suddenly it moves through the water with a bit less effort. If you could control the size of the holes, between open and closed, you are getting the hang of things. Let's kick it up a notch. So How does KW do it? KW's TVR-A, TVC-A, and TVCLH-A Valve Systems. 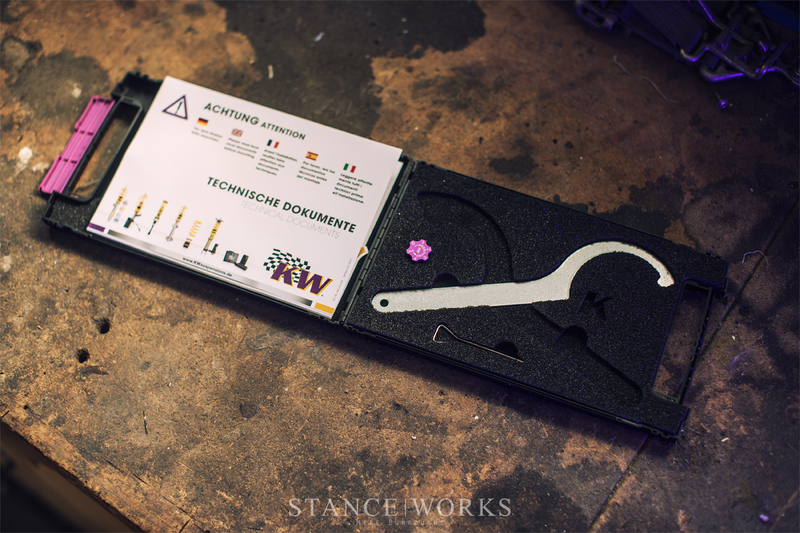 KW's product lineup is a massive one, with entry level options like their Street Comfort kits, their KW Variant 1-4 kits (which denotes factory set damping, rebound damping, rebound and compression stage low-speed damping, or lastly, rebound and compression, both high and low speed adjustments). Their Clubsport 2 and 3-way adjustable systems kick things up another notch, meant for track cars and track performance. Last but not least, there’s Competition applications as well. 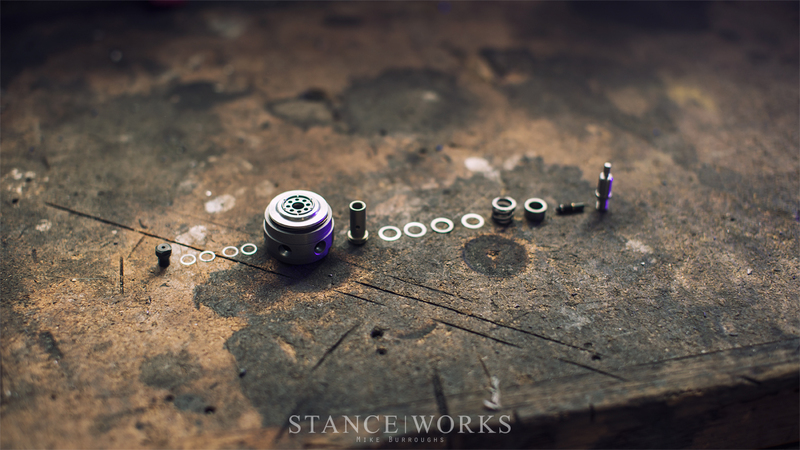 These coilovers, depending on their internal adjustability, come with different valve sets, intended to accomplish their respective adjustments. Rebound Adjustable Coilovers - The TVR-A Valve: For rebound damping adjustment, KW has developed the TVR-A, or "Twin Valve Rebound, Adjustable" valve. It utilizes an adjustment knob to offer 16 precise positions of adjustment that range from street comfort to maximum body control. The TVR-A valve works as a two-step system, separating low-speed and high-speed forces and handling them in entirely different ways. The first step - the low speed valve - works by allowing the user to adjust flow (like our ping pong exercise) through a conical low-speed bypass system. 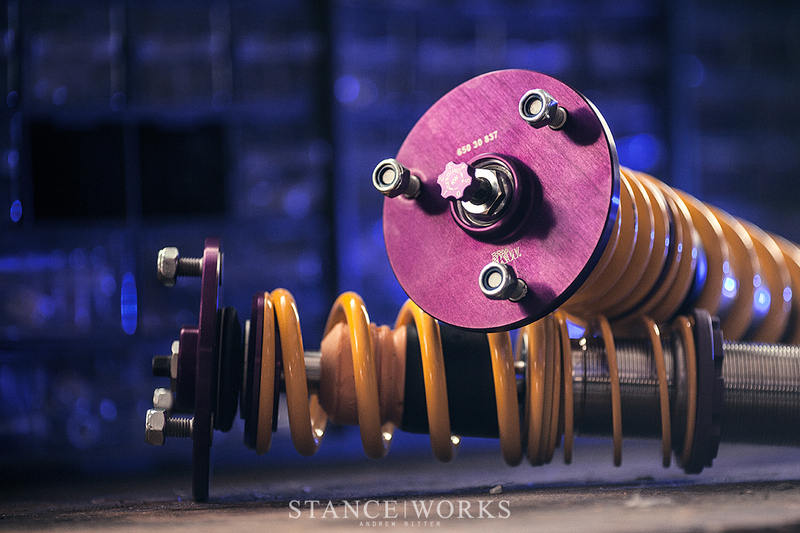 This means that the user has complete control of the shock's rebound characteristics while under low-speed forces. High speed forces, meaning harsh, rapid forces subjected to the shock, are handled by the second step - the main rebound stage valve - which needs no adjustment. KW has that handled. 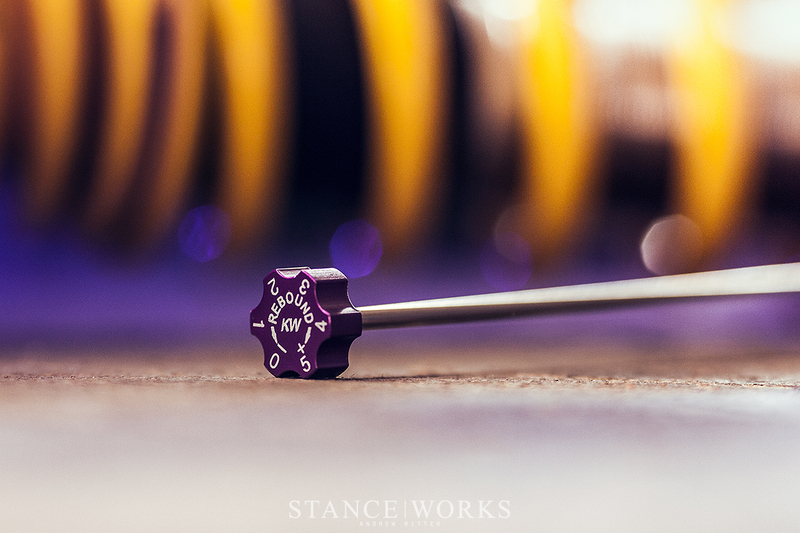 Look for the TVR-A valve in any of KW's "single-adjustable" or rebound-adjustable offerings, such as the V2 models. Rebound and Compression Adjustable Coilovers - The TVC-A Valve: Compression adjustment adds another level of control, utilizing the TVC-A or "Twin Valve Compression, Adjustable" valve, and can be found in KW's V3 models as well as Clubsport and Competition 2-way systems. 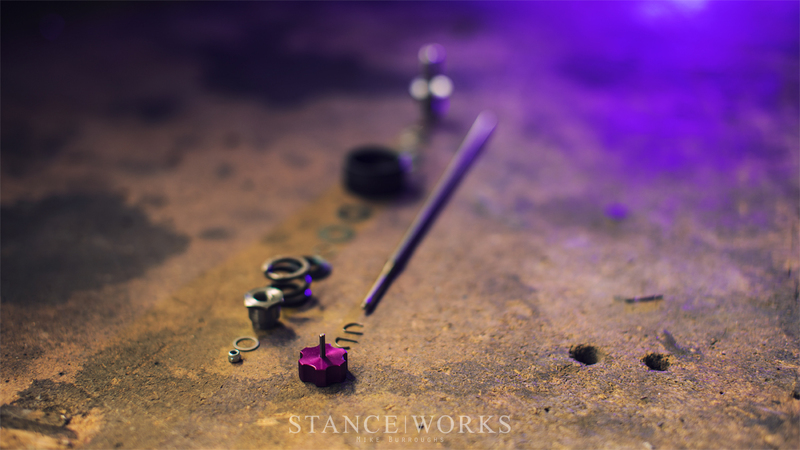 Working along side the TVR-A valves, the TVC-A valves offer 12 clicks of adjustment. That means, in unison with rebound adjustment, there are 192 positions of adjustment for incredible fine-tuning. The TVC-A valve works similarly to the TVR-A, separating high and low-speed compression, and giving user control over the low-speed settings. The adjustable knob of the TVC-A valve changes the cross-section of of the low-speed valve to achieve more or less damping during low-speed movement of the shock. For high-speed compression, the pre-tensioned needle valve and spring pre-tensioned main valve open completely, utilizing KW's internal "blow off feature" and ensuring the tires stay on the road, even over harsh curbs or highway transitions. The TVC-A valve is always paired with the TVR-A valve for true two-way adjustment and performance control. Triple-Adjustable Coilovers - The TVCLH-A Valve: For maximum control over suspension tuning, KW brings its high-end motorsports technology to consumers with the "Twin Valve Compression Low Highspeed, Adjustable" valve, or TVCLH-A, for short. It's a mouthful. The TVCLH-A technology replaces the TVC-A system in favor of high and low speed compression adjustment. Unlike the TVC-A system, which only gives the user control of low-speed shock compression, the TVCLH-A system gives control over high-speed movement too. Two adjustment dials, one with 7 settings for low-speed compression, and one with 16 settings for high speed compression, make for almost 1800 positions of adjustment in unison with the TVR-A rebound adjustment it is paired with. TVR-A and TVCLH-A valving is found in KW's V4 and 3-sway adjustable systems, and are intended for those looking to get the most out of their on-track performance while still leaving room to be piloted on the street, and comfortably at that. Mono-Tube? Twin-Tube? How High are We Counting Here? We’ll have to be careful here - this is where technical jargon will get carried away. In reality, we know we don’t need to explain every inner component of a shock, as they’re not user-serviced or meant to be disassembled. But what does “monotube” mean, and how does it differ from a twin-tube or even a triple-tube assembly (yes, it’s a thing!)? In an attempt to explain things as simply as possible, and only explaining what’s needed, the terms describe the construction of a damper. A monotube damper is just as it sounds - the internal piston, valves, gas, and fluid are all within a single tube, or housing. A twin-tube design functions somewhat differently, and while from the outside a monotube and twin-tube assembly can look similar, their internal construction is quite different. Although they function with similar principles, the inside of a twin-tube damper is essentially one housing within another. The piston and valve assembly moves up and down within an inner cylinder, with the outside chamber typically acting as a fluid reservoir. There are benefits and differences between the two: twin-tube assemblies often have a longer stroke, are more street-friendly in terms of ride quality, and typically don’t need to be serviced as often. On the other hand, mono-tube assemblies often offer superior performance on the track, don’t suffer from aeration of their oil, and can utilize a larger piston. Both layouts can offer rebound and compression adjustments, although they vary in how they accomplish this. It’s a lot to take in, I know. And that hardly scratches the surface. Thankfully, any brand worth their while will have packages suited specifically for your application. If you want to keep it simple and let KW handle the legwork, their Street Comfort series is perfect and ready to go, right out of the box. Rebound adjustment (TVR-A) is easy with V2 or one-way adjustable systems, and two-way systems (TVR-A and TVC-A) offer rebound and low-speed compression tuning if you're looking to get technical with your tuning. If you're looking to put everything you've learned to the test, their 3-way adjustable systems are sure to give you maximum performance. Now, armed with a bit of knowledge, you’re prepared to make a purchase. In any case, KW’s got you covered. Happy tuning!